Cold weather got you down? Beat the winter blahs, breeze through the rest of the season and warm up by looking ahead to some of spring’s top beauty trends. We’ve put together four must-have looks for warmer weather. For next season, look for a new, subdued take on the smoky eye to enter the spotlight. Emilio Pucci and L’Wren Scott’s spring runways showed an understated version of the popular look, using soft metallics to tone down the usual darkness. 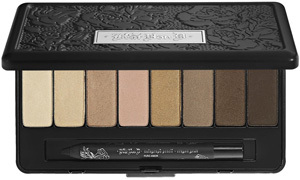 To get the look at home, try using the Kat Von D True Romance Eyeshadow Palette in Saint ($36). Start by using the chocolate brown matte shadow and apply it only on the eyelid up to where the eye naturally folds. Take that same shade and trace it under the lower lash line. Repeat those steps with one of the metallic shadows in the kit. To intensify the look, line your lashes with a black pencil and slightly smudge it. Finish with your favorite mascara. As the weather warms up, lips will really get their moment to shine. From the burst of color we saw on Jen Kao’s spring 2012 runways, to the luscious, lollipop brights seen at the Rebecca Minkoff show, pouts will be prominent come spring. Along with hues that pop, brighter shades of red, reminiscent of vintage Hollywood beauty (seen at Jason Wu and Anna Sui), will also make an appearance next season. Whatever lipstick shade you opt for, we suggest Urban Decay lipstick ($22) for their broad assortment of long-lasting hues and textures, one of which is sure to match the spring 2012 lip color trend that suits your mood. Go for the glow this spring when it comes to cheeks, which are poised to be luminescent and somewhat bright with a healthy, natural flush. One of the most effortless ways to get the look is with Hourglass Cosmetics Illume Bronzer Duo in Sunset ($40), a cream bronzer and blush duo suitable for most skin types. Over your foundation, pat either shade on the apples of your cheeks and gently blend it back toward your hairline using your fingers. 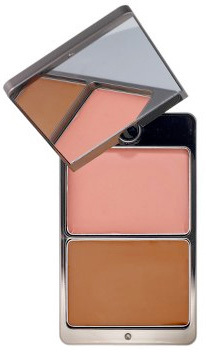 This will create a sheer finish, but you can easily layer to get the ideal shade for your skin tone. Say goodbye to over-styled hair. Spring-ready hair is glossy, textured and touchable, so give your flat iron a break and welcome back natural-looking locks. To achieve a more relaxed, touchable look, let your hair air-dry as much as possible to develop its natural texture. When dry, add in a multitasking balm (try WEN Texture Balm, $26) and gently scrunch it into the hair before you head out. This will add a healthy shine and tousled appearance without weighing hair down.